Blackleg is one of the most serious diseases of canola in Western Australia. Here we discuss disease development and spread, varietal responses, management strategies, and minimising risk from spore showers using the BlacklegCM decision tool.This page replaces Bulletin 4571. Blackleg, caused by the fungus Leptosphaeria maculans, is one of the most serious diseases of canola in Western Australia. 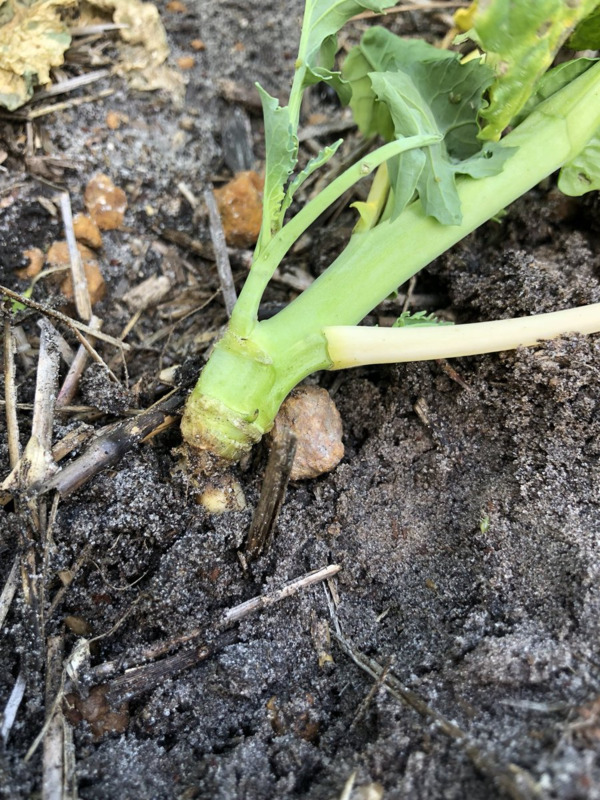 Blackleg can cause significant damage by infecting the cotyledons or first leaves early in the season, leading ultimately to crown lesions or cankers later in the season. Changes in variety choice, earlier sowing times and stubble retention have extended the risk of blackleg disease. Now, because of early emergence, later stages of crop growth are more likely to be exposed and infection can occur on all parts of the plant above ground, including canola flowers, stems and branches. 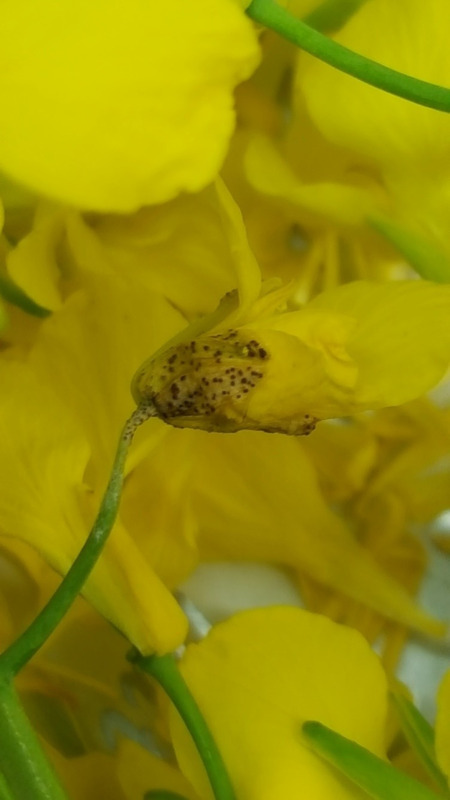 To assist with diagnosis, symptoms of the disease are described in detail on the Diagnosing blackleg in canola page. A diagnosis service is also available through the Departmen'ts DDLS - Plant pathology services (this is a chargeable service). Several factors contribute to development of the disease. While the major source of primary inoculum is canola residue, the inoculum is also carried over by infected seed (Diagram 1). However, the impact of carry-over of inoculum on seed is very low when compared with the inoculum carry-over on residues. Seasonal conditions have a major influence on the level of disease. Rains in late autumn and throughout winter stimulate the release of blackleg spores from canola residue present on the surface of paddocks. Blackleg is spread primarily by wind, with the heaviest spore fall out normally occurring within 500 metres of any canola residue. Each year canola residue continues to produce blackleg spores at a diminishing rate until the stubble has completely broken down (see Diagram 2). In WA this breakdown could take up to four years, and so the recommendation is for long rotations. Intensity of spore release from ageing canola stubble over a four year period in Western Australia (spore release in the first and the second year based upon the field trials). * Spore release from the residues that were raked and burnt in the first year. Please report disease finds to PestFax for the benefit of all industry to be aware of disease occurrences and spread. Blackleg can attack the crop at any stage, but early seedling infections are most critical in terms of the development of severe stem cankers (Diagram 1). Stem cankers from blackleg infection on canola seedlings cause a constriction in the stem just below the first leaves but above the ground leading to yield loss. Heavy seedling losses can occur under very high disease pressure and in environments favourable to blackleg development, for example, where canola is planted on top of, or immediately downwind of last year’s or the previous season’s canola crop. The blackleg fungus can attack all the aerial parts of the plant. However, it is the less obvious infection of the crown region (junction of root base and stem) that causes the largest seed yield losses from blackleg. Canola seedlings of many varieties are susceptible to blackleg until they achieve a degree of adult plant resistance, usually at about the six leaf stage. While leaf infection is the most obvious symptom, high levels of leaf infections after six leaf stage do not necessarily indicate that major losses will occur from blackleg. Fungicide strategies to minimise canker infections include seed dressings and/or in-furrow treatments. Foliar applications at the 4-6 leaf stages should not be necessary if other management guidelines are followed. The blackleg fungus is capable of attacking all the aerial parts of the plant throughout the growing season.Wet spring conditions can be conducive to aerial blackleg, which impacts flowers, stems, branches and pods instead of forming crown cankers like conventional blackleg. Upper canopy infection (UCI) is the collective term for blackleg flower, peduncle, pod, main stem and branch infection but does not include leaf lesions or crown canker. Important factors in the development of UCI are: flowering time, seasonal conditions relating to spore development and release, infection events, and the interactions of these factors. Although infection of the crown is the most damaging phase of the disease, infection of the upper canopy can sometimes lead to severe yield losses. Upper canopy infections can potentially have yield impacts from the abortion of flowers or heads, by restricting pod filling where lesions are present on stems or branches, or by causing premature ripening, pod shatter or seed abortion in pods. The extent of yield loss will vary by season and is still being studied. Symptoms of UCI include the presence of abundant pycnidia (black speckles) in affected plant parts. Lesions on the stems and branches are usually elongated with a dark margin and white centre with pycnidia. Occasionally the entire flowering head is colonised by the fungus causing it to droop and shrivel. Effective major gene resistance provides control of UCI. 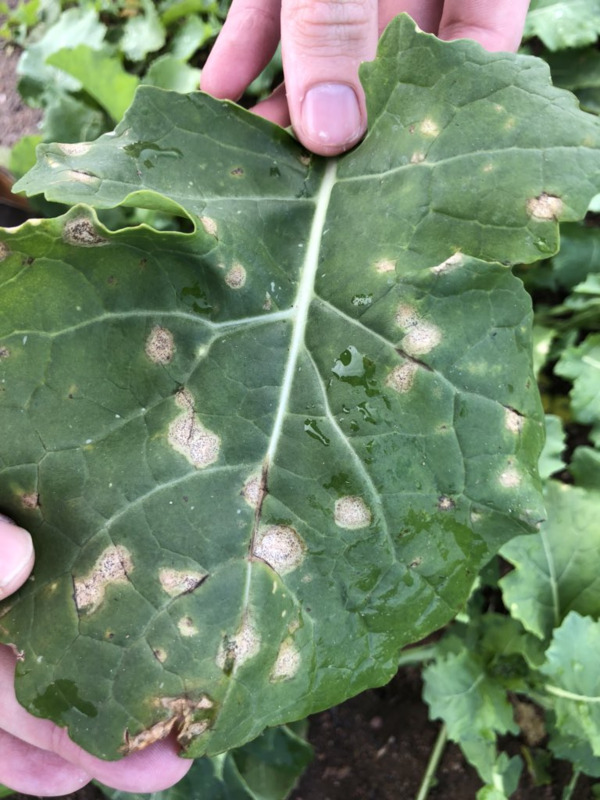 Upper canopy infection is more frequently observed in canola varieties that have low to moderate resistance to blackleg and particularly in varieties with group C resistance and/or varieties that have recently been downgraded for resistance to blackleg. It has been found to be more severe in crops that are sown under tight canola rotations. 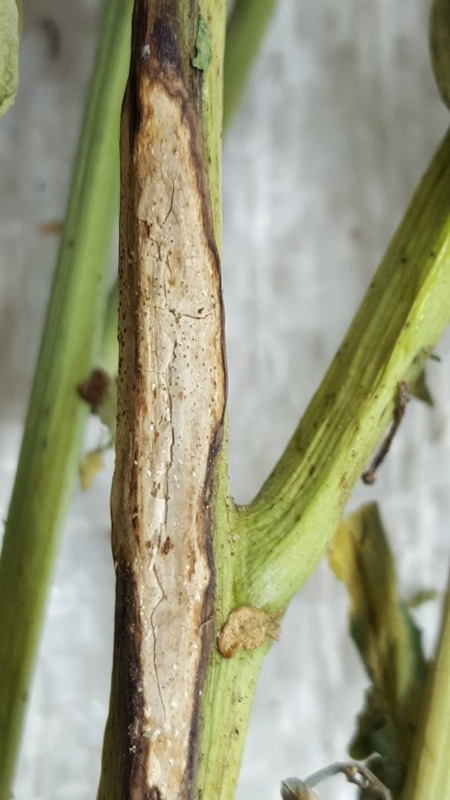 Currently, no control measures are recommended for managing UCI but research is in progress in WA and eastern Australia under the GRDC funded National Canola Pathology project to investigate various strategies for controlling the upper canopy blackleg infection. Research is being conducted by DPIRD on foliar fungicide application timing and determination of economic returns.